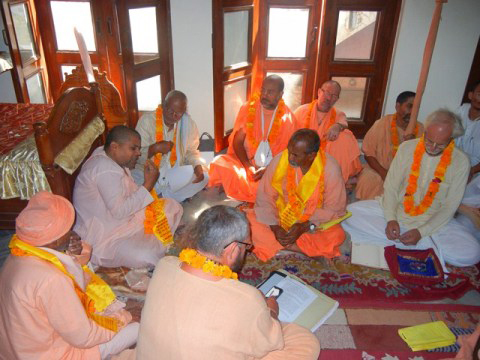 At a meeting of the World Vaishnava Association at the Gopinath Gaudiya Math in Gopishwar Mahadeva, Om Prakash Brajvasi said that all the branches of the Gaudiya Math are the result of Prabhupada Srila Bhaktisiddhanta Saraswati’s preaching, but that his contribution was yet to be fully recognized by the wider public. 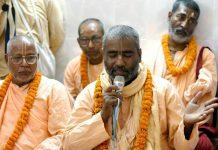 Bhakti Aloka Paramadwaiti Maharaj said that there are more than 100 ashrams and maths in the Braj area that are connected to the Gaudiya Saraswata family. 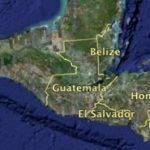 “We could be a powerful force and get a lot of things done if we were able to work together,” he said. 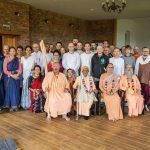 He listed a number of tasks related to the environment and the Yamuna River in which the World Vaishnava Association could play an important role. “But we are addicted to acting separately,” he said. 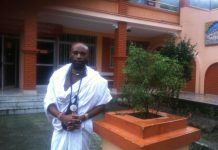 Bhakti Swarup Sannyasi Maharaj of the Gaudiya Mission said that he wanted to build a “Prabhupada Museum” in Kolkata for precisely that purpose. 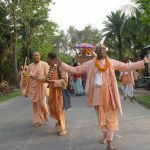 It was noted that in Kolkata, the ghats on the Hooghly River near the Bagh Bazaar Math are named after people like Lokanath Brahmachari, who may or may not ever have come there, but that a saint with the international influence of Bhaktisiddhanta Saraswati Prabhupada remains unrecognized. 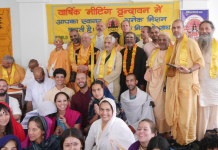 Mahavir Swami suggested why not a Chaitanya Museum here in Vrindavan, and he offered to give 400 square yards of land near Govinda Kund for that purpose. 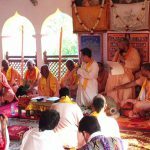 It was also proposed that a fortnightly publication called Prabhupada Vani should be started for disseminating the news of all the branches of the Gaudiya Math and missions worldwide. Mahavir Swami agreed to take responsibility for the publication and asked that all the maths provide materials to be published. 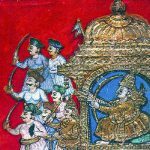 The thorny problem of the annual procession at the time of Bhaktisiddhanta Saraswati’s appearance day was tackled with little resolution. 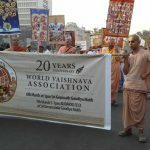 Last year another association of Gaudiya Math Vaishnavas held a procession on that occasion with the stipulation that only Srila Prabhupada Siddhanta Saraswati’s picture was to be allowed. When some participants came with other pictures and banners, they were torn by zealous defenders of the rule. This led to heated exchanges and bad feelings. Do We Have to Wait to Be Attacked?